I attempted to get Narcissu to work on my iPhone and it seems like it has worked. And it was much easier to convert compared to Tsukihime. I didn’t have to make any changes to onscripter or the script itself and it took me literally about 5 minutes. All I did was resize the images. Small title screen though, can barely make out the menu items. Have you planned to work on Fate on IPhone/Touch? Thanks for even trying ! We’re counting on you ! Could you please post a tutorial? Well. Converted and packaged a IPA for Narcissu. Note though, due to the way iPhone OS sandbox / protection is, you need to execute sysctl -w security.mac.proc_enforce=0 security.mac.vnode_enforce=0 on your iPhone / iPod Touch if you want to save, else the process will just get killed when you attempt to save. sysctl -w security.mac.proc_enforce=0 security.mac.vnode_enforce=0 has some side-effects though, like not being able to switch on/off WiFi from settings, switching it back to sysctl -w security.mac.proc_enforce=0 security.mac.vnode_enforce=1 should re-enable switching on/off WiFi. Anyways, forget about the IPA. Using IPAs means being sandboxed inside /var/mobile. I guess we’ll stick with the Cydia method of installing applications (saves the trouble of disabling and enabling code-signing since applications installed in /Applications are not sandboxed. I’m setting up a Cydia repository at the moment for visual novels. Will post back later. Ｏ(≧∇≦)Ｏ finally done it. Finished with the packaging of the deb package of Narcissu along with some of the postinst and postrm scripts. postinst to chmod a+w the save directory so it could save. postrm to rm -rf /Applications/Narcissu.app since my whole application is in a single directory Narcissu.app for tidyness sake. Hey 0neoc, thanks for the builds. Ｏ(≧∇≦)Ｏ by the way, my e-mail is yuminanako[at]yuminanako.info. Would be nice to work together with you to release packages for many many other visual novels, that is if you wouldn’t mind. Well, maybe I’m having a bit of problem with Narcissu Side 2nd, mostly due to not being able to find builds of Proportional Onscripter. Clannad, not really sure if I can get it to work, since I’m using somewhat ancient builds of xclannad for iPhone OS 1.x/2.x. Kanon, I’m the least confident about, since it probably involves trying to compile xkanon for iPhone OS, most probably would be a pain due to compiling GTK libraries for iPhone OS. Oh ya. I just remembered one thing, mind helping me test a Narcissu information page I made for the iPhone OS? My iPhone & iPod Touch currently is not available. Heh, I guess I was somewhat bored. It’s about choice of fonts. I might repackage Narcissu or add a update to Narcissu, since I really dislike the default font and yea, fonts seem to render differently on onscripter and by the OS. I was thinking about asking you to try a font and tell me your comments about it. I’ve also modified some parts of the script of Narcissu, (setwindow) to change the font size without making it look bad. After looking for some free open-source SJIS (Shift_JIS) Monospaced fonts and trying them out one by one, I think I might have found a nice font. 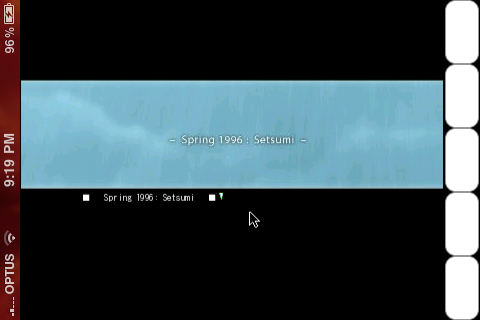 The current font inside the Narcissu deb package isn’t really open-source and yea to be honest, it looks pretty bad. Finally finalized my prerm, postrm and postinst bash scripts. 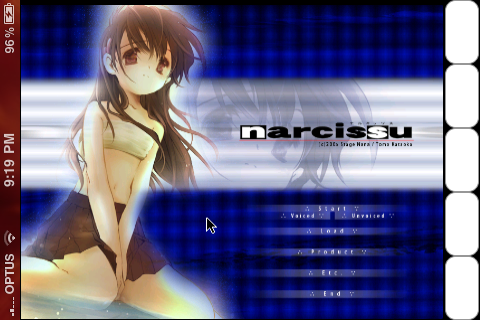 Now when uninstalling Narcissu, it would move the save files to /var/mobile/Media/NarcissuData. Sure I’d love to work with you. And you seem to type a lot every time lol, have you got MSN or something xD? We’ll talk more over there. And the info pages look pretty good. xD don’t mind me, I can be rather talkative somehow. Hmm, got Gtalk or anything? If you have Google Talk, then add my e-mail address. Or if so, whats your msn? Haha, see you on Gtalk then. I know this is more than a month old but, I tried the IPA with my ipod 2g with 3.0 and it just crashed installous. Then i tried the cydia package with the source but also crashed cydia and can no longer go into cydia. It just goes back to home when i try. Then now i jailbreak my ipod to 4.0 (the new one that came out a few days ago) and i tried both ways again. It did not work, i can see the app on my springboard, but just go back to home if i try to boot it up. Also, i tried to get Clannad on my touch with this guide http://salburg.net/clannad.html but the files that are needed are no longer there. I could be wrong, but i believe it uses the same files as this one does. Maybe you could work with that. I’m afraid I did not make the IPA or the cydia package, it was done by someone else, “Yumi Nanako”. Even so you have some weird problems… Have you tried following the tsukihime guide? You can pretty much use that guide for every game (except the converter, you will have to download the onscripter tools from somewhere, and use the sarconv and nsaconv to resize the images). but have you tried the IPA and the Cydia package? I’m starting to think its my firmware that wont let me play it being that alot of apps i got doesnt seem to work well either. I might try the guide you made if i get the time. Do you still get in touch with “Yumi Nanako”? Haro. ._. Sorry for the lack of news. Been rather busy with RL issues. But yea, going back to make new packages. By the way, don’t use the IPA. lolz.. The IPA is really broken, somewhat..
Might try to package a Clannad / Kanon ^^ in this sometime. Yes please do clannad! Thanks much for your hard work. I’m using iPod 3G and iPhone 3GS with 3.1.3 and it seems to work fine. Tons of changes in 4.0 that breaks stuff with 3.x so yea.. So currently there is no way to run any of these VNs with 4.0? ;_; damn it I wanted to play VNs on my iphone so badly, is there any way to fix this? I just got os 4.0 so I’ll give it a look later when I’m free. thank you in advance. I’ll just wait patiently then. Check out the new blog post, I’ve sorta gotten it to work, just need to fix some things. Ok, it looks like it is working nicely now. Could you please make a quick guide on how to port Narcissu to Iphone? 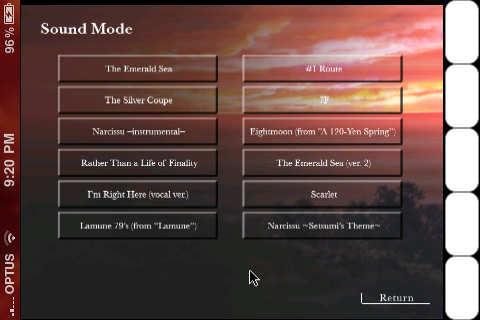 I tried following Tsukihime and Umineko guides, but its really confusing since so many actions are unique for those games. Also, I don’t understand where to take that tool to convert images. I downloaded onscripter tool from the site you wrote about, and theres only one exe file – onscripter-en, which doesnt launch: “No game script found”. You got the wrong thing. Scroll down a bit more on the download page and you should see “Onscripter Tools”. It is a collection of commandline tools. Open up SDLAppParams.plist and Info.plist. Replace “/Media/ons/Umineko” with “Media/ons/Narcissu”, and replace “iVN.onscripter.Umineko” with “iVN.onscripter.Narcissu”. Assuming you’ve done everything else correctly, you should now be able to play the game properly. Though it seems like the text is too small (the one on your screenshot looks fine, while mine is reeeeeally hard to read.. or are they the same?). I got the screenshot, is this how it is supposed to work? ren, your screenshot of Narcissu on your iPhone looks like it is zoomed in too much, resulting in the text and menu items appearing in the wrong places. It appears you resized arc.nsa using the GUI version of nsaconv to 66% which is incorrect. The optimal resize for Narcissu (that is originally 800×600) would be 52.75%. You also seem to have needlessly enabled the “-j” option (BMP to JPEG) in your conversion, which is causing that big green rectangle to display under your text cursor. Anyways, the only problem I’m having with this Narcissu conversion is the moire pattern in the title screen caused by the resizing. Since nsaconv does not seem to have any access to the title screen image, reducing the JPG quality won’t help at all. It’s a minor annoyance though, as everything else is flawless. Although I’ve read the comments, it’s still hard to follow via different places people are jumping at. Sorry if it’s an inconvinience, is there an official tutorial? So, I finally fixed my iphone and updated it to 4.2.1. Its jailbroken too. I had the same problem with pretty much all other times I have tried doing this. The problem is when I enter mobile terminal apt-get install ldid, it says it is not a command. I then try skipping it. It then says no file in such directory. I know it is there because I have checked mutiple times. (I have also 777 the files). So I tried skipping that command; the security step works fine, but the chown -R step says that it is not a command. Please help! Any status on this plot? Check the iOS App store. I just ported Narcissu to iPhones and iPads using my VN Engine and released it.